Though the term clamshell may apply to a number of devices that consist of two hinged parts and open and close in a fashion similar to the two shells of a clam, it is most commonly applied to the plastic packaging of this design. Clamshells – Valk Industries, Inc. Most commonly made of clear polyvinyl chloride or PVC, durable clamshell containers are preferred by retailers as they provide increased product visibility from several different angles. Clamshells also protect products from environmental factors while deterring theft and tampering as they are difficult to open, often requiring the use of a knife or scissors. Despite there rugged construction, clamshells are lightweight with a high strength to weight ration that makes them suitable and inexpensive for product display, packaging and shipment. 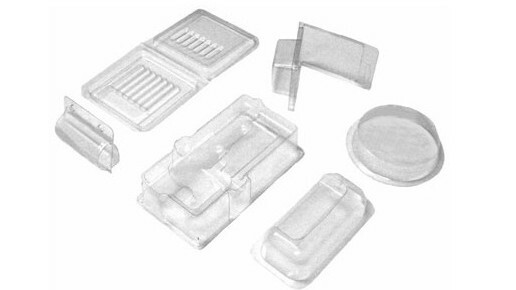 Such versatility makes clamshells among the most popular plastic packaging forms available and they are commonly employed in such varied industries as food, cosmetic, medical, entertainment, household appliances, office supply, packaging, clothing, retail and electronics. Custom and stock forms are widely available in a number of different shapes and sizes. Molds are often based off of a specific product to ensure the best fit and visibility. 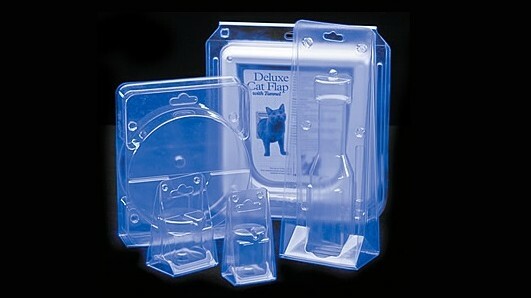 A number of plastic forming processes can be implemented in the production of clamshell containers. Thermoforming and vacuum forming processes begin with sheets of PVC that are fed into electric, natural gas or infrared heaters. Materials are warmed until they become pliable and soft, at which point they are guided into a forming station. A mating mold and pressure box enclose the sheet before a vacuum is used to remove all excess air, pulling the plastic into the mold. Pressure forming is used when precision molding is desired or required as high air pressure causes greater adherence to the mold allowing for the production of finer detail in the finished clamshell than thermoforming alone. In either case, the PVC is cold while still on the mold. Once rigid reverse air flow ejects the clamshell which may be two separate components or on a single sheet that is folded to create a hinge. Once the product is placed within the shell, the edges are fused through heat treatments, welding or stamping to create an airtight case. The most common types of clamshells include tri-fold clamshells which have a flat bottom for standing on display, clamshell trays which combine packaging with product display and egg crate clamshells which hold and divide several like products such as golf balls. Clamshells Clamshells are specially-shaped plastic containers with two hinged halves composed of rigid plastic that when sealed together encapsulate a product.